Rainy (yet again!) here in northern California so my sketch group (Ready, Set, Sketch) met at the Santa Rosa mall. I’m always surprised at just how much there is to sketch there. I’d gladly go back on another rainy day. 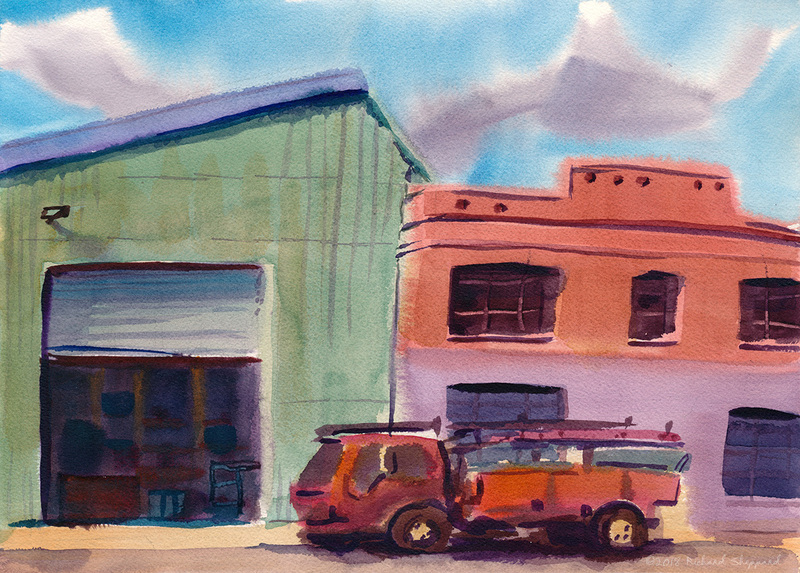 This quick sketch was done from the food court (located on the second floor) overlooking 3rd St., Santa Rosa. March 9, 2019 March 9, 2019 Richard SheppardComments are off for this post. 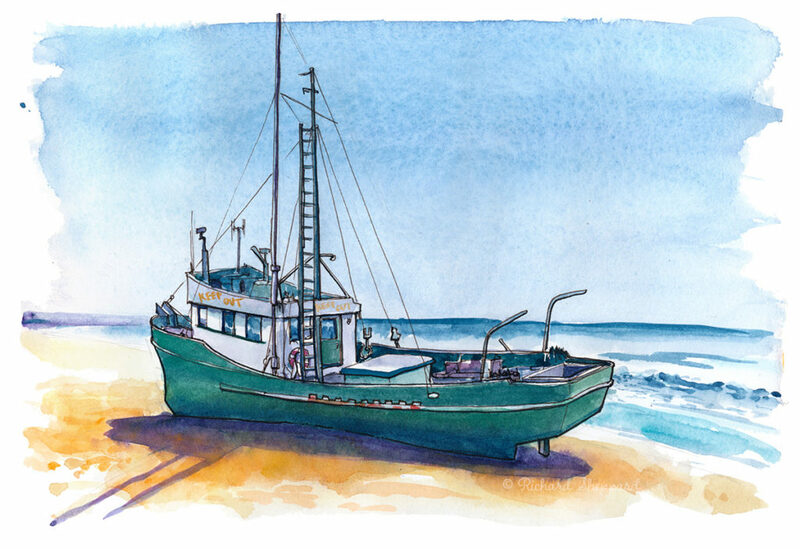 I’m excited to announce that I will once again be teaching my travel sketching class this year for the San Francisco Bay Area Urban Sketchers 10×10 series! Together we will tackle a new location (Golden Gate Overlook) and discover new styles and techniques that will enhance your sketchbook and make any trip memorable. I recommend signing up soon because it will likely fill up fast! Here is the link to my registration page. January 28, 2019 Richard SheppardComments are off for this post. Before last weekend, I had never sketched Fort Point Lighthouse, located just below the towering Golden Gate Bridge. The iron lighthouse was built in 1863, but once work began on the bridge in 1933, the lighthouse was obscured from view and soon decommissioned. A fog signal and navigational light were then placed at the base of the bridge’s south tower. It became a National Historic Site in 1970 cementing its perch overlooking the bay. If you haven’t experienced the bridge from below, you’d probably be impressed by the energy surrounding it. The structure’s enormous size, the sounds of non-stop traffic, the tide moving in out of the bay in conjunction with the weather swirling around the span all provide an electrifying experience that crackles with energy. I sketched atop the fort for a couple of hours, before strong winds, fog and cold drove me to seek shelter in the fort below. October 25, 2018 October 25, 2018 Richard SheppardComments are off for this post. 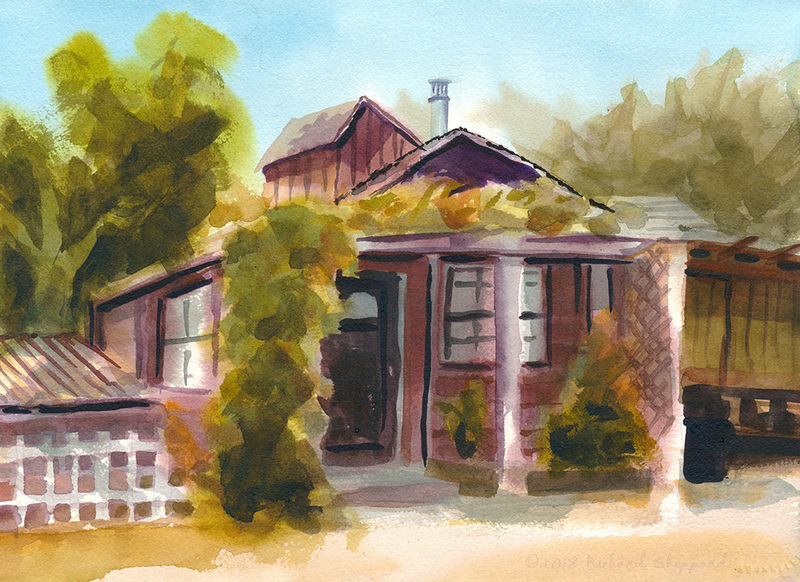 Great day out sketching at Redwood Hill Farms. The Bice family started the farm 50 years ago and although the goat cheese operations were sold a few years back, the farm remains in family hands. It’s a gorgeous place to sketch! I chose this small cottage thinking it was a fairly easy subject to paint but quickly found out to the contrary. My biggest problem is still not going dark enough and having to do multiple layers. I’ll have to work on that. October 14, 2018 Richard SheppardComments are off for this post. Last weekend I took Tom Hoffman’s workshop for the second time in San Francisco. We had a blast and I learned quite a lot. I love Tom’s style and was determined to learn as much as I could over the next four days. On the first day we were to use a photo (I chose this one) as a warm up exercise before heading outside to sketch from life. 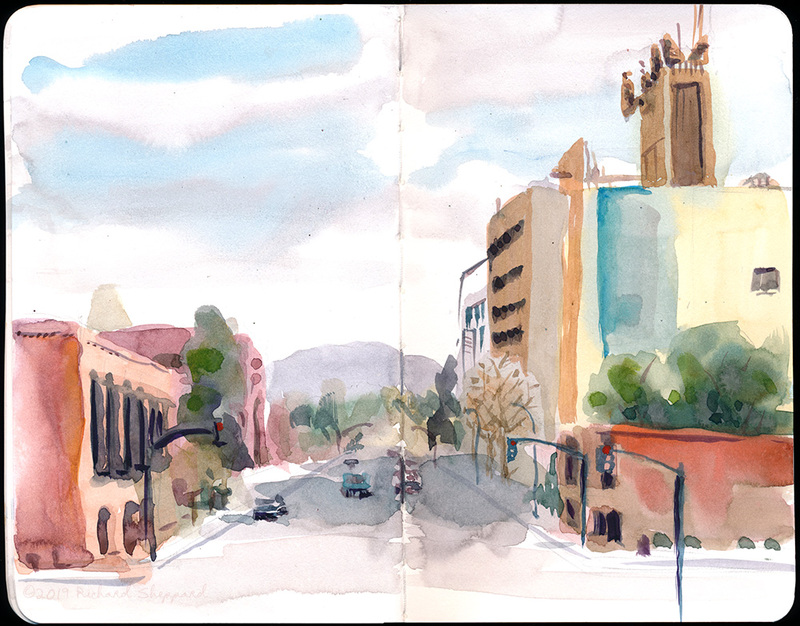 This second sketch was painted on the corner of 17th St. and Texas St.
May 6, 2018 Richard SheppardComments are off for this post. Another great jazz performance at the Art Alliance here in Cloverdale, California last Thursday, this time featuring the Jacob Szekely Trio. Lately I have been monstrously busy with work but managed to duck out for a couple of hours and check out the show. 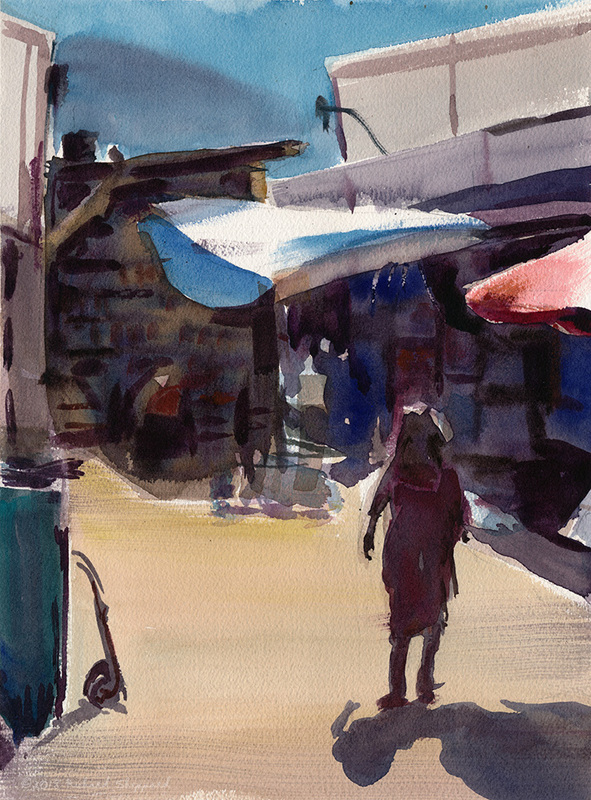 The second annual SF Bay Area 10×10 Urban Sketching Workshops are happening this spring! 10 instructors, 10 classes. Each class is limited to 15 students. I’ll be teaching the class “Unraveling the Complexity of Travel Sketching.” Sign up before they sell out. As of writing this, my class is already half full in less than a day of open regestration! March 3, 2018 March 4, 2018 Richard SheppardComments are off for this post. I think it’s safe to say that all of us Bay Area sketchers had a great time hobnobbing with world famous sketchers Liz Steel and Jane Blundell today. There were probably 60 sketchers total. 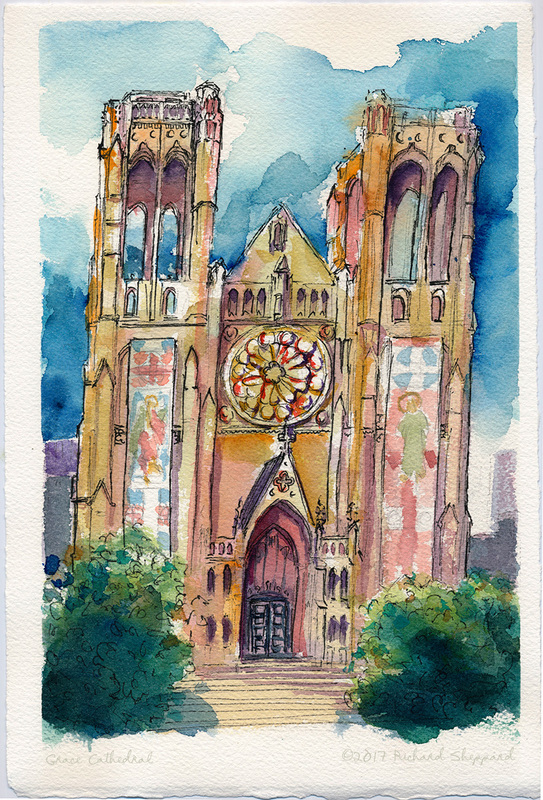 Though socializing was our purpose, Grace Cathedral was our sketching subject. Thanks to Laurie Wigham for organizing the event! September 24, 2017 Richard SheppardComments are off for this post.